There are two kinds of hand-me-downs that everyone loves. The first is a hand-me-down wedding dress for that “something borrowed,” and the other is tried and tested family recipes. Some recipes have been handed down from one generation to another, from a mother to a daughter or a daughter-in-law. However, just as an old wedding dress might need some tucks and lifts to give it a modern spin, an old-fashioned recipe sometimes might need a few tweaks to bring them into the modern day. Green salads are simple. It’s made from lettuce, some tomatoes, drizzled with Caesar dressing and some crispy croutons. However, for an updated twist on the green salad, replace bread croutons with crispy pan-fried tofu cubes. For the salad dressing, instead of mayo made from oil and egg yolks, blend some soft tofu, olive oil, anchovies for salt, and lemon juice for some zest. It’s a healthier and tastier version of a salad favorite. Potato salad is another favorite appetizer that needs a revamp. Instead of using mayonnaise, blend some yogurt and hummus to make the potato salad dressing. Add some salt and pepper to taste and add some finely chopped chives for added flavor. Garfield, our favorite fat and lazy feline, loves lasagna, and who can blame him? It’s made from layers of lasagna pasta sheets, marinara meat sauce, cheese, and white béchamel sauce – what’s not to love? However, for a creative twist, replace the lasagna strips with pocketless pita bread to make the layers. Spicy Buffalo wings is another classic favorite that could use some changes. Instead of spicy pepper, coat the chicken wings with some green or red curry powder and pan fry with some butter or olive oil. You are sure to look at this finger-lickin’ classic with new eyes. If you are hankering for some beef stew but you have tons of other things to do, here is an easy way to get that craving fixed. Bust out that slow cooker from the shelf and prepare to cook your beef stew in it. Sear the meat beforehand for that extra flavor. Afterwards, place the seared meat inside the slow cooker. Add the other ingredients and let it cook throughout the day. Once you get home, just grab a slice of bread and enjoy your beef stew in the comforts of your home. Craving for something sweet but you don’t have a lot of time. Don’t you wish you have some time to prepare cheesecake or bake some brownies? 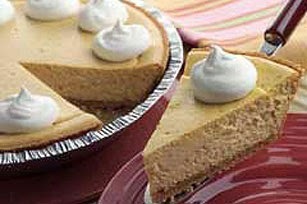 Fret not; try this three-step pumpkin cheesecake from Kraft for an updated twist to the classic dessert. Mix some cream cheese, sugar, canned pumpkin, eggs, and spices in the blender. For your spices, add some cinnamon, cloves, ground nutmeg, and vanilla. Once blended, pour the mixture over the Graham crust and bake for 40 minutes. When cool, put it in the fridge for at least three hours. Serve with some whipped cream as topping. Sprinkle some more cinnamon powder over the whip cream for added zest. You may also use cocoa powder or powdered sugar to sprinkle on top of the whipped cream.